Take care of business simply, elegantly and securely with Good Work. 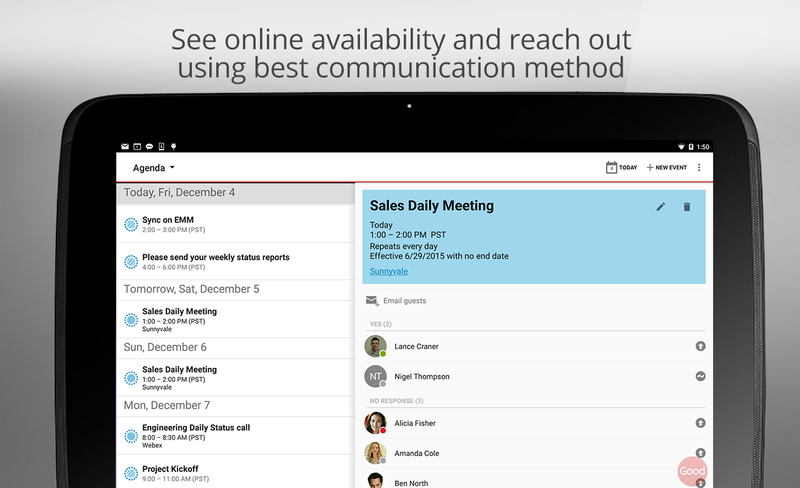 Stay on top of your business email, schedule and join meetings, and manage your contacts with an easy to use, all-in-one app. Good Work delivers a personalized business experience. See your colleagues’ photos in your email. View online availability to chat everywhere you work – in email, a calendar event and on their contact card -“ a capability unique to Good. 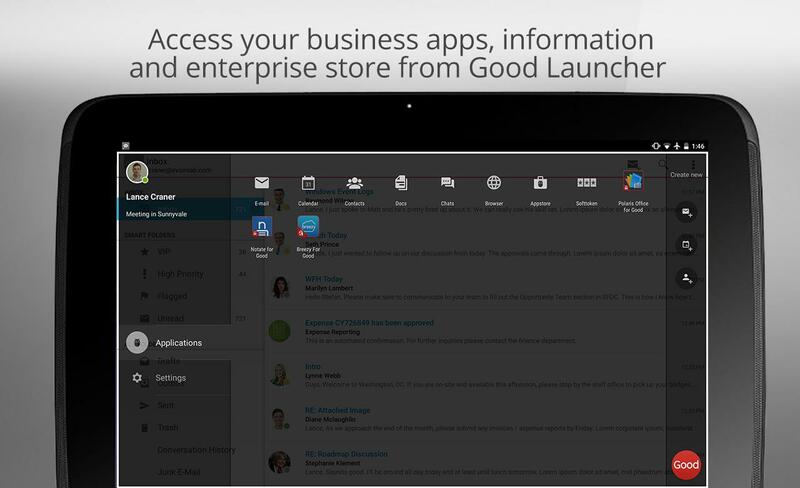 Quickly navigate among your business apps using Launcher. Switch easily between composing an email, adding a contact, or scheduling a calendar event with quick action buttons. And always know that your personal privacy is protected without intrusive geo-location capabilities. * Launcher: Simplify multi-tasking and app navigation with easy switching between your email, calendar, contacts, app settings and other Good apps. * Quick actions: Work smarter with quick action buttons to compose an email, schedule a meeting or add a contact. * Email: Manage your inbox on the go! Check and respond to email, securely view multiple-format attachments (.pdf, .doc, .ppt, .xls, etc. ), move messages to a folder, and take and attach photos. * Calendar: Stay in touch with your colleagues, customers and partners wherever you are. Join meetings or schedule new ones. Even send a quick reply message if you are running late. * Contacts: See all of your Outlook contacts, personal and work. Add additional information to the contact card or get the caller ID by sync’ing the contacts to the device. 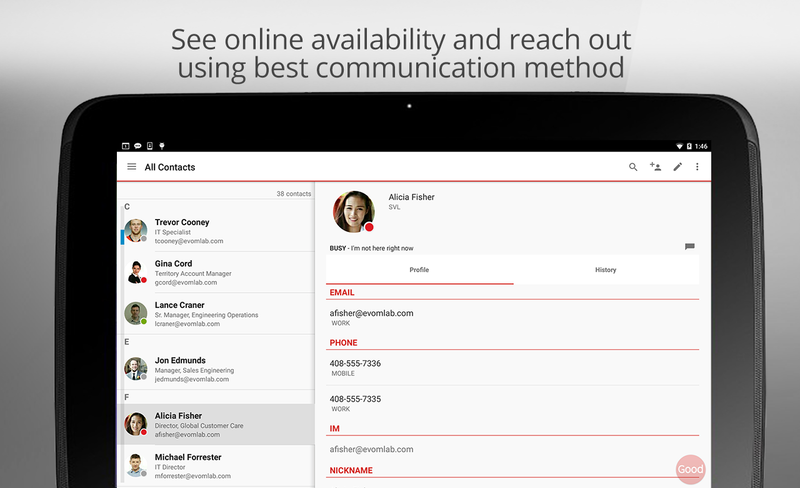 * People centric collaboration: Choose the best way to reach your colleagues based on their online availability status. Initiate a call, an email, an IM or an SMS from within the app them based on their availability. * VIP notifications: Never miss an important message. Set VIP status for key contacts to be notified via custom alerts when they send you an email.